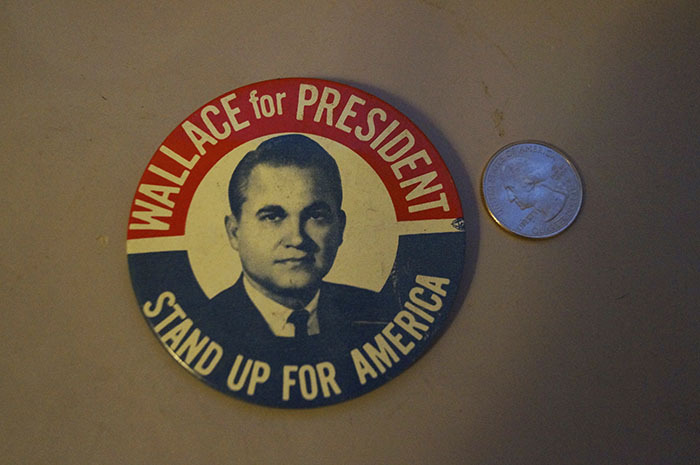 This is a large pin-back from infamous segregationist Governor George Wallace; it says “STAND UP FOR AMERICA”. 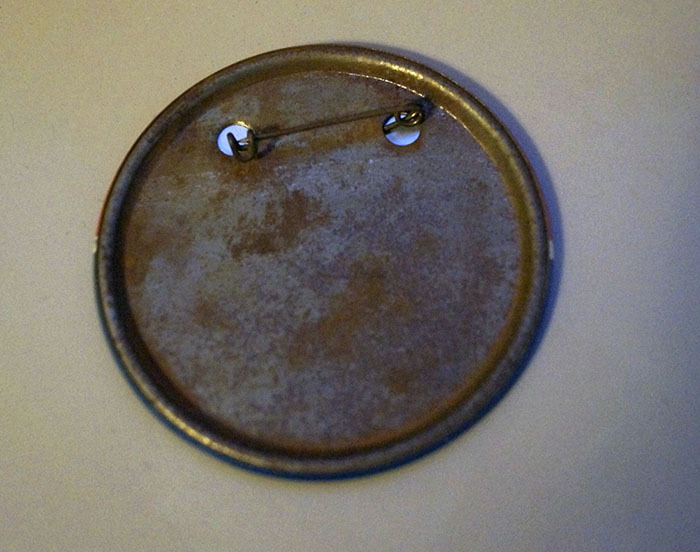 Pin has light rust on the back. 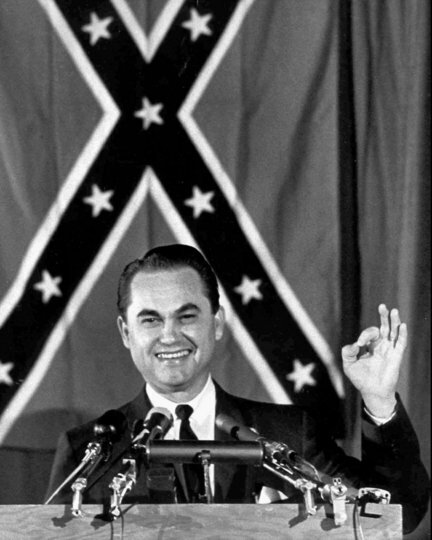 Based on the photo, I’m guessing this was Wallace’s 1964 bid for President. 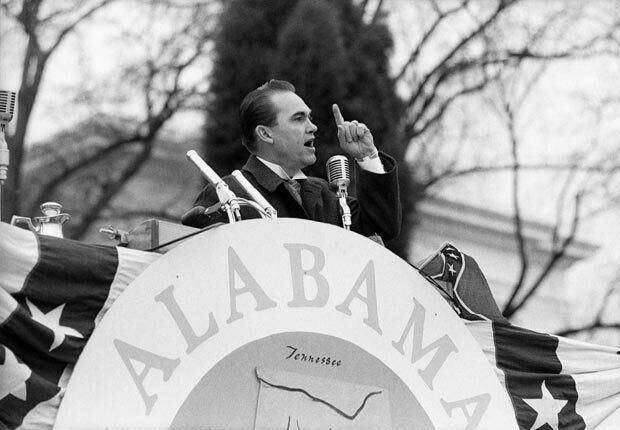 In the 1962 Gubernatorial race, Wallace won a crushing victory in the November general election, taking 96 percent of the vote. Democratic dominance had been achieved by disfranchising most blacks and many poor whites in the state for decades, which lasted until years after federal civil rights legislation was passed in 1964 and 1965. In 1963, President John F. Kennedy’s administration ordered the U.S. Army’s 2nd Infantry Division from Ft. Benning, Georgia to be prepared to enforce the racial integration of the University of Alabama in Tuscaloosa. In a vain attempt to halt the enrollment of black students Vivian Malone and James Hood, Governor Wallace stood in front of Foster Auditorium at the University of Alabama on June 11, 1963. This became known as the “Stand in the Schoolhouse Door”. In September 1963, Wallace attempted to stop four black students from enrolling in four separate elementary schools in Huntsville. After intervention by a federal court in Birmingham, the four children were allowed to enter on September 9, becoming the first to integrate a primary or secondary school in Alabama.